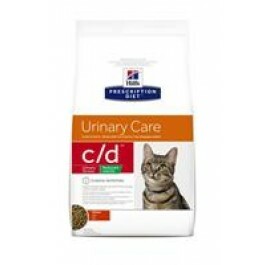 Hill's Prescription Diet c/d Feline - Urinary Stress Reduced Calorie is recommended for obese-prone cats with Feline Lower Urinary Tract Disease (FLUTD), including crystalluria, urolithiasis, sterile-struvite stones, as well as cats with Feline Idiopathic Cystitis (FIC). Reduced calorie intake through controlled fat. High levels of L-carnitine, clinically proven to maintain lean muscle mass. High levels of Omega-3 fatty acids to help reduce discomfort. Chicken (32%) and turkey meal, maize gluten meal, brewers rice, cellulose, maize, beet pulp, flaxseed,vegetable oil, minerals, fish oil, animal fat, L-carnitine, digest, vitamins, DL-methionine, taurine, crustacean shell hydrolysate, trace elements, cartilage hydrolysate and beta-carotene. Naturally preserved with mixed tocopherols and citric acid. Hill's Prescription Diet c/d Feline - Urinary Stress Reduced Calorie should be recommended by your veterinary surgeon. For detailed information on feeding amounts and how this food can help your pet, please consult your veterinary surgeon. These ranges are a starting point only because pets' needs vary. Adjust the feeding amount to maintain optimal body weight.